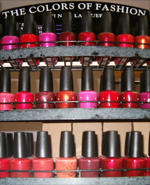 John Anthony of Novelty, Inc. is a full service Hair and Nail Salon located in Novelty, OH. in the heart of beautiful Geauga County. We are committed to the art of beauty. Our guests are offered a wide variety of hair, nail and skincare services, and a large selection of professional hair, nail and skincare products. Our team of professionals strive to provide each guest with quality service and a personalized salon experience.